Its sad that I have to put this up but I feel that honest feedback is what keeps a business strong. I contacted Pro-line to enquiry about a full brake line kit for my car and said I was in a bit of a rush as I had a competition on the 17th April so wondered if they would be able to help out in time. I was told that yes it wouldn't be a problem as they should be made by Monday 11th April and posted to reach me by Tuesday 12th April. Great, we discussed options and agreed what would be needed and a cost. This was paid immediately and payment was confirmed. And then the wait for Tuesday started. I sent an email at lunch time to Pro-line just checking that everything was on time, nerves were starting to get to me as it was my first competition and we had a lot to do to the car. Received an email from Pro-line in the morning saying kit will be leaving instead on the Tuesday for Wednesday delivery. At this stage other bits were happening with the car so was no worries. Later in the day I though I would check who they use for postage and get a tracking number so I didn't miss the parcel but I got no reply. Sat waiting fully expecting the lines to turn up to my work but nothing appeared. Now getting very nervous as car was sitting with new calipers on and no hoses to connect everything up. 2pm came and we usually have all our deliveries by then so 2:45pm I phoned Pro-line to ask what was going as I had still not received any tracking details and I was getting very nervous about where my money and lines were. Mitch answered but was in the van driving. I asked if they had been posted and he said they had been posted the previous day Wednesday 13th I asked via who and what tracking number but he did not have them on him he would get back to me. Email in the morning at 7:25am from Pro-line asking if they had turned up which no they had not. Then another at 8:26 saying they should definetly be with me today (15th) I again asked for a tracking number and was emailed a photo of the Post Office receipt showing that they had only been sent Recorded Delivery on the Wednesday 13th at 16:58pm. Two problems with this is Recorded Delivery only goes in the standard mail bag with no package tracking its only use is to know that someone has signed for it when it arrives and its not a guaranteed next day service. Plus with being posted at 16:58 from a small village sub post office they could have had their last collection at 16:30 so it doesn't then get collected till the next day. So I then had to do a round trip of nearly 150 miles to pickup parts as instructed by the garage to get the setup required. The next problem was my mechanic had a wedding to attend on the Saturday so wouldn't be able to work on the car. Thankfully I got all the parts back by 6pm and with the help from a friend we managed to get piped plumbed in and working by 11pm. And breathe! Road tested all good phew panic over!! 930am postie arrives with a big envelope that required a signature and guess what I open it up and lonebehold look what arrives the brake lines and bias valve. Competiting for my first time and loved it, managed a 1st in Qualifying for my class and then bang my gearbox lets do oh well promising result. My focus was then on trying to find out what had happened to gearbox. Wednesday 20th April I sent an email to Pro-line explaining that I would like to return the brake lines and bias valve as our initial conversation I had been clear when I needed them so I was then forced to rectify the issue. I was then told that of course I can return them but I would be hit with a 25% restocking fee!! This I was not aware of and had not seen anywhere on their website or on any Scoobynet adverts. They put it down the fact as I had asked for blue hoses and a hydraulic handbrake. If i had chosen black or clear they could of perhaps waved the restocking fee. I have received no Invoice or Receipt from Pro-line highlighting any Terms of Sale and the only place that I have now been informed by them that states there Terms and Conditions is on a eBay shop that they run but no on their official website. So here I am with a kit that I was more than happy to have in the time frame that had been promised but due to promises being let down by Pro-line and the kit being sent out later than they said I was forced to rectify the situation at further cost and time of my own. Also I bought a standard off the shelf brake bias valve which is an off the shelf non custom part and they expect me to pay 25% on that too. So thats me out of pocket to the tune of £87.75 plus the postage back and my time and diesel to rectify the problem. It's frustrating when companies will not do what's right when they are at fault, though my understanding from the above is that you did not use the eBay channel to purchase though bought via a telesales route? If that is correct then the T&Cs either have to be explained via telephone at the point of purchase or you need to be directed to them (Link to website, via email, via post etc...) and allowed time to satisfy yourself that you are happy with them. If this has not happened then the company is unable to enforce their T&Cs. Do you have any written correspondence from them agreeing to the timescales you have mentioned above or stating that the parcel had been posted at the earlier times? Also do they state anywhere how long delivery takes? My next steps would be a strongly worded email or letter via recorded delivery and then legal (Depending on answers to above). I certainly would not be accepting that loss or using them again. If they have agreed to specified timelines they are in breach of contract and therefore you should not expect to be out of pocket. Equally, I am sure you could argue that if the T&Cs are on their eBay site but not their primary website those restocking fees are only applicable to eBay sales; if you have bought direct and their normal T&Cs either don't exist, or are not explicit in detailing the restocking fees, then you cannot be held to account for them. I believe you have right to a 7 day 'cooling off' period wherein you can return your unused goods for a full refund. Having received your stuff on the 16th, technically your were quite within your rights to request a return for refund before the 23rd with no argument. There may possibly be some dispute over the custom brake lines, but the valve is a standard part. If there is no mention of 7 days on their T's & C's then you you automatically have a 3 month return window. Even if Pro Line quibble about the custom brake lines, they are in breach of an agreed contract because of late delivery so I think if you take this approach you will (eventually) get a full refund. There are a lot of myths around returns and you have additional rights through a distance purchase. At the very least a full refund and an apology is in order. Making promises you cant keep and then blatantly lying to your customer who then nearly didnt make his event and ended up out of pocket,, TUT TUT.. come on Pro Line sort it out !! My order certainly wont be getting placed now until you can get your customer services in order. I see there is another thread too with another member having problems in returning incorrect parts. All communication was done via email so I have full proof of what was and wasn't said and my requirement for the time frame I required them in was stipulated from the start. As for request for colour again no mention of any issues regarding a restocking fee if I decided to return the equipment. Its a shame as their kit looks very good but when it doesn't come when agreed my hand was forced to find other alternatives. At no point was it mentioned anywhere about any specific terms or agreement regarding the sale and even looking on their website or facebook nothing was mentioned neither was anything said in all our conversation. As the last communication from Pro-line basically states that they are awaiting me to return and will refund less the the restocking fee it looks like I will be taking legal advice to pursue this. They even said they were going to send their T&C's for me to read through and that was on the 26th of April and they are yet to appear. Go to Trading Standards and have a chat with them. **** that, how did you pay? Seems a new trader is going to go nowhere on this forum if that's how they act. Unfortunately I paid via BACS as I thought I had nothing to fear as using a dealer on Scoobynet. Well a 'new' dealer. Which needs to get their name first. Just because internet brands take money off them to subscribe doesn't mean they are decent. Anyone can pay to trade makes no odds. Hope you get sorted though as its total bull that they feeding you. As i have said in previous email to yourself..i am very sorry for your dissapointment in service i tried my very best to get that order to you in time for your competition as you know. The restock is a company policy as it will be very hard to resell that kit being the colour and kit you asked for...that said, i hvae made the decision that i will in fact wave this and issue a full refund upon return of the kit and bias. Once again i appologise for your upset and dissapointment. We have sold over 100 kits through this very forum with no negative feedback re the bias. Only Non ABS modeled cars have a proportion valve as standard. Last edited by Pro-Line Motorsport; 29 April 2016 at 10:46 PM. I do think you need to look at your custom and practice though. As you need to make people aware of theach terms you are going to impose. And will find yourself on a sticky wicket if you continue like this. Ifor you cannot offer someone something on time please do not offer it as a service. We aren't race teams with unlimited funds or time. And if needing something for a competition that we have spent hard earned money on and it is not on time. People get very upset. Look at my custom and practice? I made Ians order high priority ahead of MANY others to try and please him, ahead of actual race teams waiting on full brake/fuel/oil system lines for 10 Aston Martin GT cars which is very high priority as you can imagine! Ahead of 5 group buy orders on this very forum, do i need to carry on? I said that he'd have the kit for his deadline to which i kept to my part of the deal, its not my fault they weren't delivered in time...Im sorry but i do not work for the royal mail. I sent the kit on the wednesday (its irrelevant as to what time of day wednesday as all post is collected at the same time) I contacted on the friday after a telephone call from Ian on the thursday to see that they were delivered (bad customer service huh?!) They were sent royal mail first class recorded which is what all brake line kits are sent out and usually arrive the following day not 4 days later in this case maybe the people of this thread should start a hate thread against royal mail instead. I pride myself in my work and my business so take this with great insult, i have appoligised over and over, have now offered a full refund upon return of the kit. Once again, i apoligise to Ian for all of this and hope we can move on from this. Last edited by Pro-Line Motorsport; 30 April 2016 at 09:05 AM. Priority order you make an exception and send via special delivery guaranteed next day by 1pm, recorded is hit and miss and cannot be tracked. Priority order you make an exception and send via special deliverye guaranteed next day by 1pm, recorded is hit and miss and cannot be tracked. Would just like to add that my experience has been good, I had the full kit. Always got back to me. I can understand that people get s bit upset waiting for things but sometimes these things happen. I paid for some billet fuel rails from cdf 2 months ago and still haven't got them yet. Luckily for me I'm in no rush as building up the car but considering I was told they were installing new machinery at the time and order would take a couple weeks and it's now been 2 months!! They are valves on both but they are different: The valve on ABS car is a proportioning valve. The valve on non-ABS cars is proportion with pressure limiting. They look similar but behave differently. Anyhoo, as Banny has menioned, I should point out...Royal Mail's "signed for" service (aka recorded delivery) only has compensation coverage for up to £50. 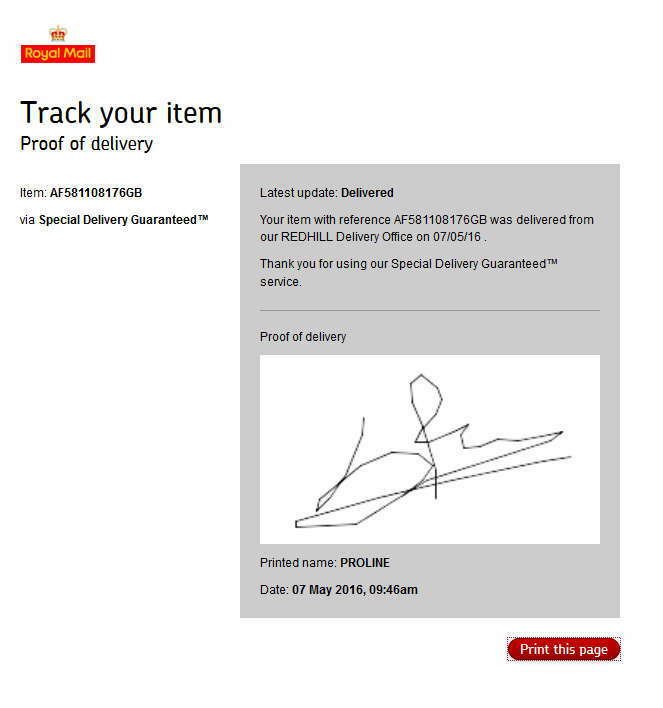 If I was the sender and posting £350 worth of goods I personally would not even offer this as a method of postage even if the recipent demanded it. In contrast the "Guranteed by 1pm" service offers £500 compensation for loss or damage. Glad its been sorted out, but I do think it could have been easily avoided. NEOFOX- Seeing as we have not heard back from you or have not received the parts back, shall i assume you are now keeping the kit? If so can mods please remove this thread. No parcel was sent on Friday Special Delivery you will have it on Monday. Sorry but I was away on business. Hmm......'special delivery' and no parcel? Maybe our postman is as useless as Ians! Joking aside, no..no parcel although it can be a bit hit and miss with where it ends up as our address is a 'Brooklands' as are 3 others on basically the same road..hopefully Ian can trace and let me know. Last edited by Pro-Line Motorsport; 12 May 2016 at 10:16 PM. You'll need to speak to one of your staff then as it was delivered on time as paid for with Royal Mail their service was spot on. Really interesting how companies treat people after an event. Why would you want to call out a customer in public, especially as it seems you were wrong? It would be interesting to find out who signed for the parcel and who they work for, also what you intend to do for the customer after letting them down, providing difficult after sales service and then calling them out incorrectly in public. The mass reaction to the ScoobyClinic farce was because of the after sales service, not the actual event as every company has idiots that work there. Everybody makes mistakes. What matters is how things are dealt with afterwards. Thanks for that Ian, I will do some investigating today!! You will also need to forward your bank details for the refund. 8ulldog, am not sure what you are stating there as calling a customer out? Have you not read this thread? We are providing a refund for Ians brake lines that didnt turn up on time, they were not wrong or damaged etc, just merely didnt turn up on time. As you say its easy for everyone to jump on the bandwagon....as you have!! Last edited by Pro-Line Motorsport; 13 May 2016 at 08:30 AM. I read your post about "useless postmen" and interpreted it as being disingenuous. In my experience professional companies do not act in this manner. As for having read the thread, I have. Its great that you are offering a refund though to what lengths has the OP had to go to to get what he is entitled? You make it sound like you are doing him a favour, you are legally obliged to do so. You hoped to have given him less money back when you failed to meet the agreed deadline for delivery. You then questioned his integrity around posting back the item (I assume you are also reimbursing him for this expense?!?). I wonder if you would have resolved this to the OPs satisfaction without him exposing his experience on ScoobyNet. I am entitled to my opinion and have no axe to grind with you. I also never will as I will definitely not become a customer of yours after experiencing this thread.